Surprisingly, people still often think that we are just a ‘printing house’. But why this is an outdated impression, you can read in our blog ‘from supplier to strategic partner’. Based on 90 years of experience and a good understanding of sector-specific process challenges, we are much more than a ‘printing house’. Especially for large local, national and international organizations in the medical, medical and pharmaceutical industries we are a print service provider and a strategic partner in developing smart printing solutions. The medical sector requires specialized knowledge and solutions in the field of process optimization and quality assurance. With a dedicated supply chain team, we work with customers such as Medtronic, Abbott and Merit Medical to adapt standard processes to their specific needs and we devise ways to structure production processes as efficiently as possible. In this way we can guarantee the continuity and reliability of the delivery, support effective stock management, minimize costs and improve your company results. This all starts with the right preparation: we ensure that we understand what you need, carry out a quality control audit and carry out a test assignment before proceeding with the production. Do you want to know more about how this workflow continues and how we can adapt standard processes to specific customer needs? 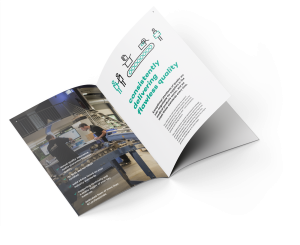 In our brochure you discover the complete workflow in detail, our unique way of working and the 5 benefits we guarantee our customers.